Do You Want A Top Quality Padded Exercise Mat To Use At Home Or Take With You To The Gym? Then This Super Soft Workout Mat Is Just For You! It’s thick, comfy and lightweight. Perfect for Pilates, floor based work, stretching, pregnancy workouts and all kinds of core and ab training. You can feel the luxury of this fitness mat – its warming touch makes you unaware of a cold floor, slippery wooden laminate or carpeting underneath. We use Premium A grade NBR foam which is soft and thick but also light enough to carry easily + it’s easy to roll up using the FREE removable strap – perfect for throwing over the shoulder or hooking on a coat rack to keep tidied away until your next workout. Focus on working out instead of avoiding pain! Whether you’re stretching before a run or doing an ab workout, this thick exercise mat provides a supportive noise reducing surface to exercise on and the non-slip foam grips to the floor to prevent injuries – although highly polished surfaces may still need caution. 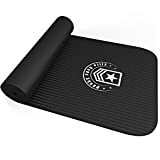 This is also a very versatile gym mat, can be used as a camping or ‘travel mat,’ for picnics, fishing or as an extra convenient ‘roll out’ bed for sleepovers. PLEASE NOTE – this mat may not be suitable for some forms of Yoga because of its thickness and length, which is great for most floor work, but may feel a little unstable when balancing or twisting. Click the “Add To Basket” button NOW (top right) to give your body the softest most comfortable workout you’ve ever had, completely risk free!